Shared Skies speaks to the connections between global, local and personal. As people look toward the sky each morning, through the day or each night, the sky speaks to their personal and local concerns. In a global sense, we observe the effects of our environmental decisions and find community through a seamless sky. 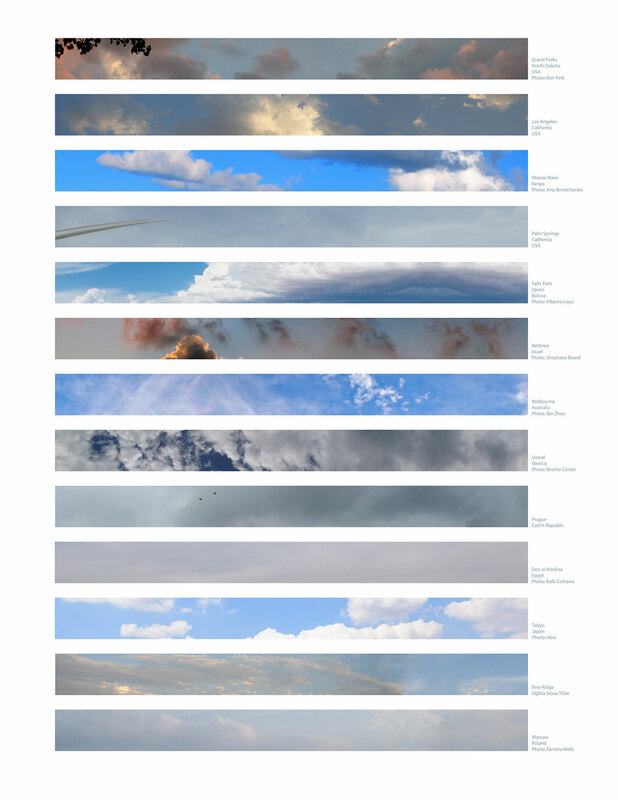 Shared Skies’ photographs are being collected through four situations: Abeles’ journeys and artists who participate as they travel worldwide, international friends through social media, and some purchased from photographers through stock photo sites. Shared Skies began as a permanent public artwork for the Anderson-Munger YMCA that is being built in Koreatown, Los Angeles. From the Salt Flats of Bolivia to Grand Forks in the United States, and Maasai Mara, Kenya to Pine Ridge, Oglala Sioux Tribe, our skies portray the connected parts of our place on this earth.